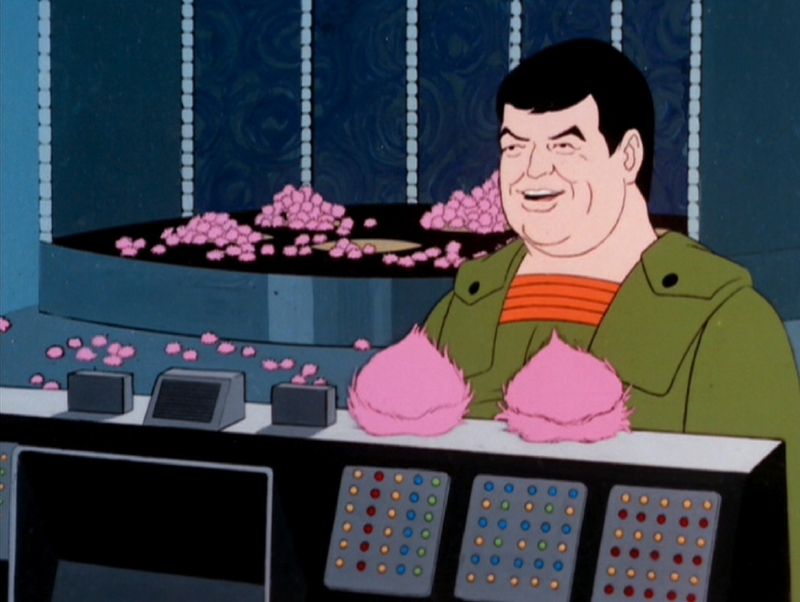 Animated STAR TREK - "More Tribbles, More Troubles"
PSA epilogue for "More Tribbles, More Troubles"
Unlike in the original STAR TREK series, where the tribbles were white, tan or brown, the tribbles in this animated episode were all the same color: pink. This episode's author, David Gerrold (pictured), also wrote another Animated STAR TREK episode "Bem". He also wrote the script for the original STAR TREK series episode "The Cloud Minders." David Gerrold recently said that both "Bem" and "More Troubles, More Tribbles" were originally written as possible episodes for the original STAR TREK's third season. He said that Gene Roddenberry asked him to write the tribbles sequel, but that it was dropped when the show changed management. In the mid-eighties, Mr. Gerrold helped Gene Roddenberry create STAR TREK: The Next Generation. 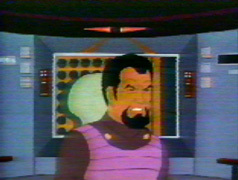 The Klingon captain Koloth was seen in this episode and was originally seen in "The Trouble with Tribbles." 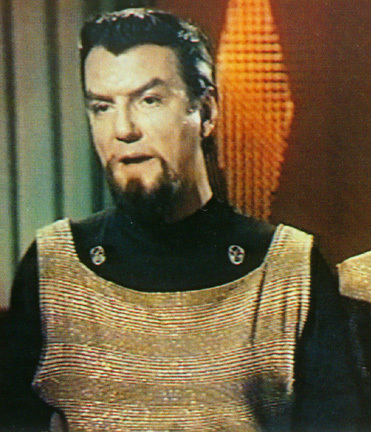 Koloth was played by William Campbell (pictured) in the original series but was voiced by James Doohan in animated form. 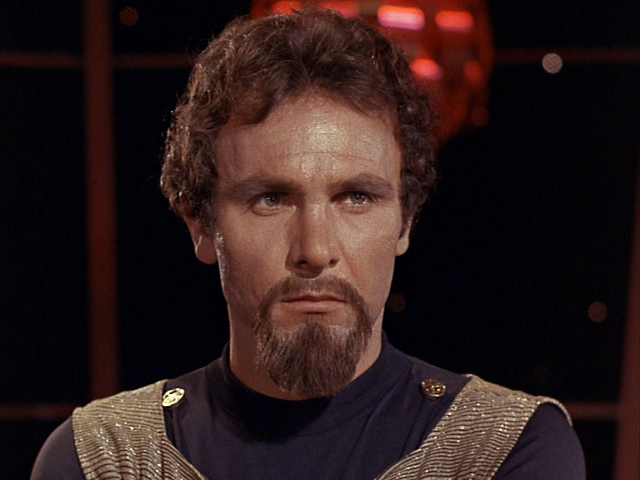 William Campbell did later reprise his role of Koloth on the STAR TREK: Deep Space Nine episode "Blood Oath." The Klingon Battle Cruiser seen in this episode is examined in detail on its own page in this site. The character of Korax had originally appeared in "The Trouble with Tribbles" and was played by Michael Pataki (pictured). Korax was voiced by James Doohan in animated form. There is a page in this site that focuses on the Starfleet Cargo Drones that were featured prominently in this episode. There is also a page devoted to the Scout Craft used by Cyrano Jones' in this episode. 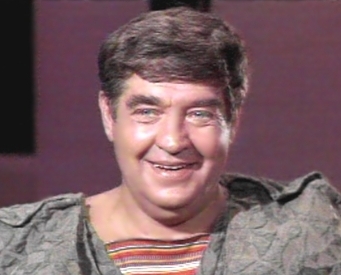 Actor Stanley Adams reprised his role of Cyrano Jones by providing the voice of the animated Cyrano Jones. Adams was also a scriptwriter and he co-wrote the original series episode "The Mark of Gideon" with George F. Slavin. 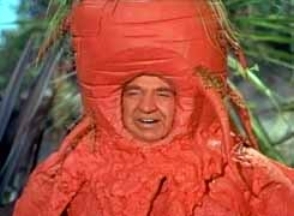 Stanley Adams is also remembered for portraying Tybo the huge talking carrot in "The Great Vegetable Rebellion" the February 28, 1968 episode of Lost in Space. In the episode, which is arguably the worst segment in the show's history, Tybo captures Dr. Smith and turns him into a stalk of celery and tries to do the same to the rest of the Robinson family. Mr. Adams passed away in 1977 at the age of 62. Out of the 22 animated episodes, "More Tribbles, More Troubles" was the only semi-comedic animated episode - the others being fairly serious. In this story, Cyrano's comments, the glommer's antics, the Klingons' reactions to infestation and the large tribble in Kirk's chair that got bigger from scene to scene - coupled with some humorous quips from McCoy, Scotty and Kirk - gave this episode several comedic turns. Despite these isolated funny elements, the rest of the episode still had much in the way of story and adventure with the Klingons. In the original series, Klingon battle cruiser fired weapons from the front of the twin lower propulsion units. 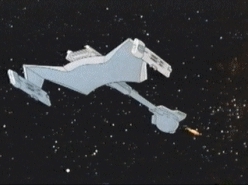 However, in this animated episode, the Klingon ship fired yellow photon torpedoes from the front "head" of the ship as would be seen again in STAR TREK: The Motion Picture in 1979. Again, just as was seen in the second bridge exit, the animated series ushered in a change that would be picked up in the live-action and canon STAR TREK! There were two visual errors in this episode: In one scene, the elevator doors on the bridge were shifted a little to the right. (Picture showing elevator error, 35KB jpeg). 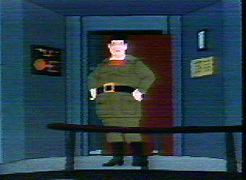 In a later brief scene, Captain Koloth was mistakenly placed on the bridge instead of on the bridge's viewscreen. (Picture showing this second error, 35KB jpeg). "More Tribbles, More Troubles" was novelized by Alan Dean Foster in Star Trek Log Four published by Ballantine Books in March 1975. Also novelized in the book was "The Time Trap" and "The Terratin Incident".